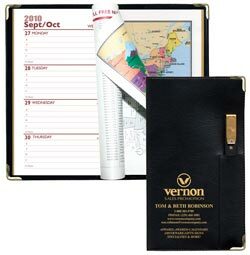 Personalized Gilded Weekly Planners w/ Metal Corners, Flat Pen and Leather-Look Covers. Inexpensive, Promotional. Black Crush, Wine Crush, Skai Black, Green Crush, Blue Crush. Budget Prices in the USA and Canada. 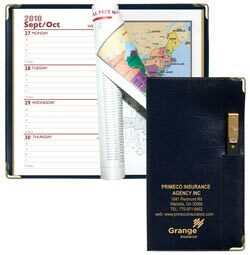 Executive Metal Corners Weekly Planners with Leather-Look Covers, Gold-Look Pen and Gilded pages. We also supply blank (not imprinted) Executive Metal Corners Weekly Planners at EQP (End Quantity Price). 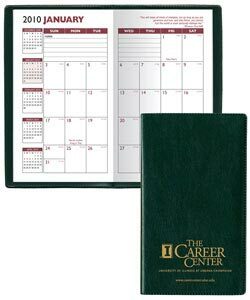 Lowest cost in USA and Canada for promotional Gilded Weekly Planners. American clients pay no taxes. 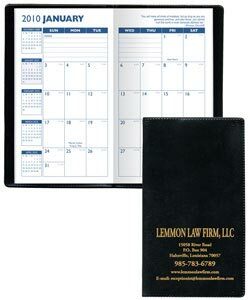 PRODUCTION TIME: 5-15 days after art approval; Blank (not personalized) Executive Metal Corner Weekly Planners ship next day. 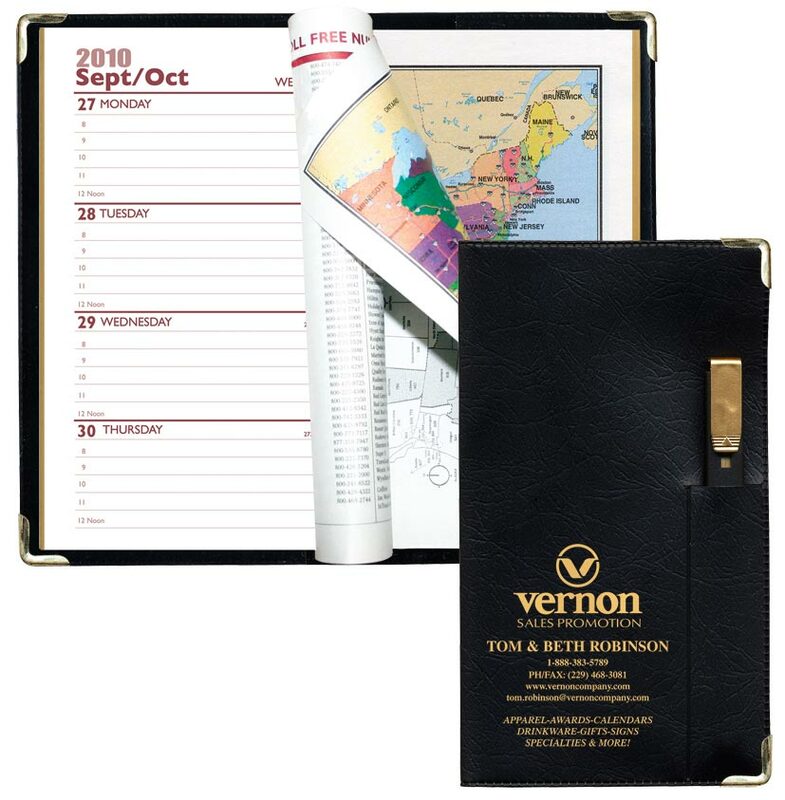 Our executive 128 page, week at a glance pocket weekly planners feature gilded edges, metal corners and leather-imitation executive vinyl covers. It also includes a Flat Gold Tip Pen in a pocket of the front cover. The planners display one week on a two page spread in a one color print. 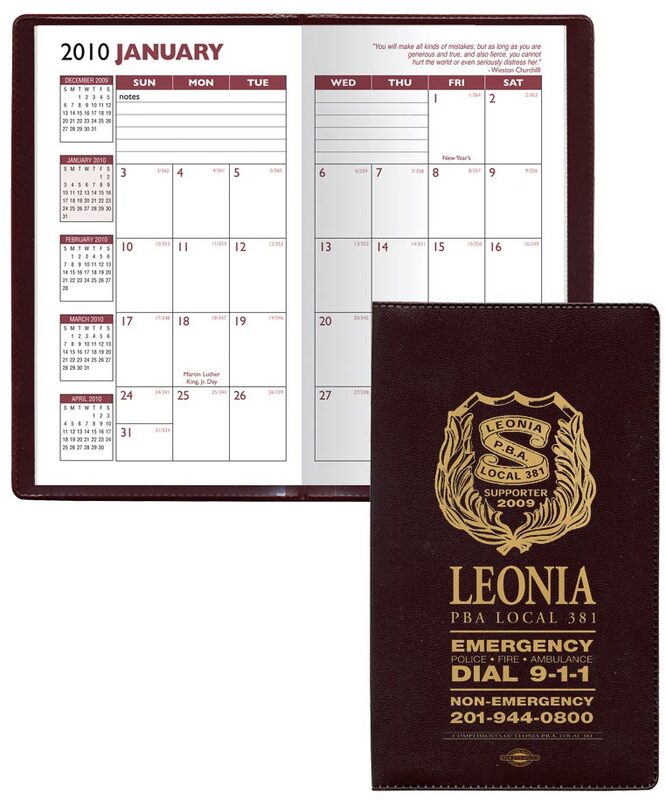 This planner includes pages for important phone numbers and dates as well as advanced planning areas. Some other additional features include a metric conversion chart, time zone chart, popular 800 #'s list, area code map and important holidays page. It also features a full color 8 page U.S. Atlas with city maps. 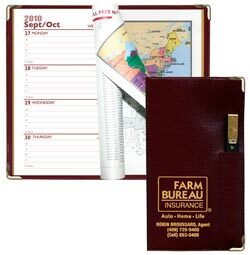 Item Size: (Open) 7-1/2" 6-5/16", (Closed) 3-3/4" x 6-5/16"
Flat Gold-Look Tip Pen in a front cover pocket. Product Weight: Approx. 25 Lbs. per box with 125 planners.